We offer a full expert fitting service on all flooring products including all types of carpets domestic and commercial, Karndean vinyl flooring, laminated wood and solid wood floors. We are based in Sothend on sea Essex. 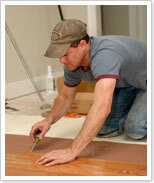 All of our fitters are fully qualified tradesmen. We offer an insurance backed guarantee on all installations for the lifetime of your new floor covering. Our Southend on sea based carpet and vinyl flooring teams also install coir matting, Sisal and Sea grass along side contract installations of full stick broadloom carpets and carpet tiles for commercial areas. Most products are fitted in days rather than weeks like the large national carpet shops. Let us help inspire you with our expert team of hard floor layers, who carry out all aspects of design floor installation, from latex screeding and ply boarding preparatory works, to the planning of bespoke Karndean design borders and feature pieces. Our hard flooring experts also lay linoleum and Polyfloor and all solid vinyl products and non slip flooring such as Altro to restaurant / pub bar areas, commercial kitchens and disabled areas which require flooring to run up a cove with waterproof hot weld joints. Our wood flooring and laminate flooring installation team have over 20 years experience of laying many types of parquet, solid timber, and veneer type flooring. We cater for both in home and contract locations such as schools, clubs, bars and larger scale commercial installations. All of our fitters are highly skilled, and fully insured. We have installed over 1 Million square meters of flooring over the last decade alone. Abbey Carpets are based in Southend on sea, We cover Essex, London the home counties and the South of England, but if the job is large enough we do travel nationwide. Please see below for our standard rates - if you have a large order price can be negotiated. All prices are subject to survey and minimum charges apply. If in doubt call our shop on 01702 416465 we will be happy to arrange a FREE estimate for you.